she looks very good and regal. That is a gorgeous colour and a lovely dress. She looks elegant. Yes, the dress is nice, but the hat is over the top. 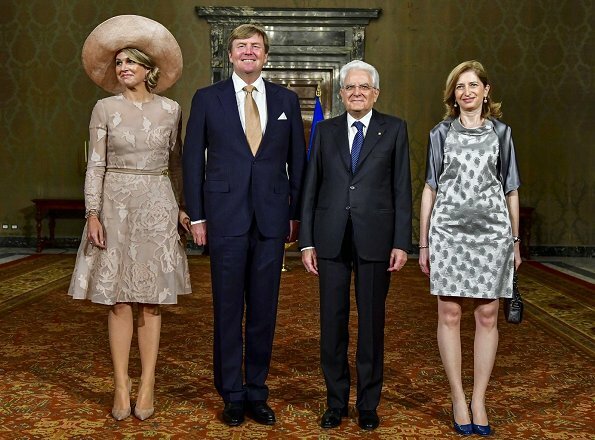 Maxima's hats are always over the top. It's her style. I wouldn't wear it [where would I wear it?] but she carries it off. 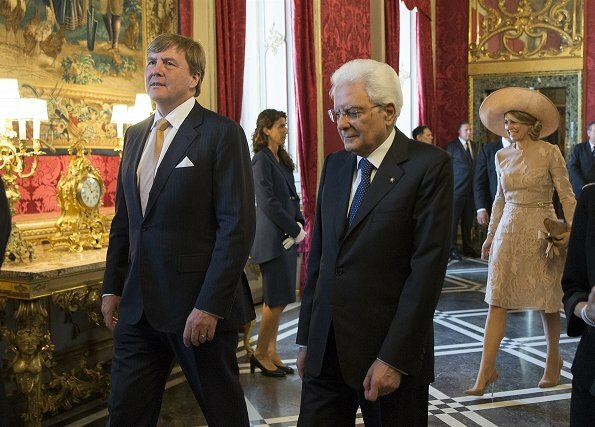 I must say that standing next to the italian president and his wife, she looks giant. Wrong choice for this occation, sometimes Maxima s adviseurs don t check the context of her presence. wow, Maxima 's glowing! fantastic look,gorgeous! Most of her hats are over the top. She sure stands out. The dress is so boring to me...the hat, fantastic, as usual. The dress IS a lovely fabric and color but I wonder why she chose to have a less-full skirt instead of the one shown on the model? Wouldn't it be nice if the photographers looked to see how the people are standing and offer some advice? The poor president's daughter could have turned a little and looked much nicer. I doubt she'll save this photo. @K Hass, this is not the fault of the photographer, not in a life shot, it would be different when taking a portrait or group portrait, but on place, they can't work with much light and use the flash light of the camera, and this causes problems with shiny materials like the dress of that lady, which has also a very poor fit, that makes it worse. And for Maxima.. she is 'outstanding' again :-))) I love the monochrome color and the whole look, the dress is beautiful, I also think it would have been even better with the full skirt of the model, and - well - the hat is 'big'. Sometimes I ask myself, will they get even bigger with her aging, or did we already reach the end?? A sea of beige. Some contrasting element would have been nice. 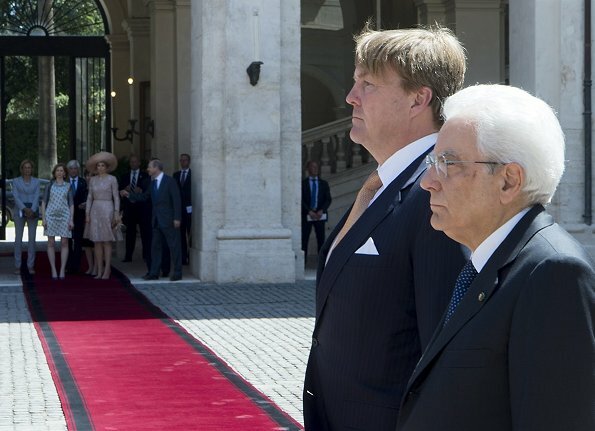 The king´s matching tie is a nice touch though. I don't care for her dress, pretty blah, and of course the HUGE hat way over the top. The President's daughter choice of dress is sad, wrong colour and doesn't fit right. But then again where Maxima is she totally eclipses the other women. She has to stand out. Always. She looks lovely but all i can think is "long sleeves" You have no idea how hot is now in Italy!!!! Yes, but think of the gentlemen, they always have to wear long sleeve shirts and jackets, no matter where they are and how hot it is, most ladies on these pictures wear jackets. 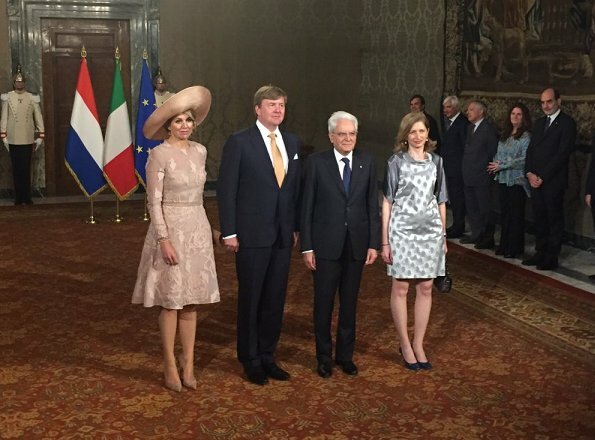 Maxima seems to be fine with this dress. 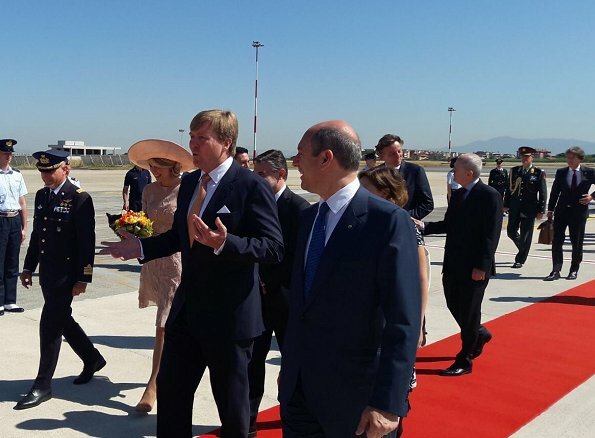 Of course, if it were Letizia, she would have appeared sleveless, tightless and in tower high slip-in sandals.